Unusual? Yes. But are you here reading this because you're at least interested? YES! We recently came across this recipe and definitely wanted to give it a try. In skimming the comments from other recipes, readers have fond memories of relatives on the East Coast making the dish. 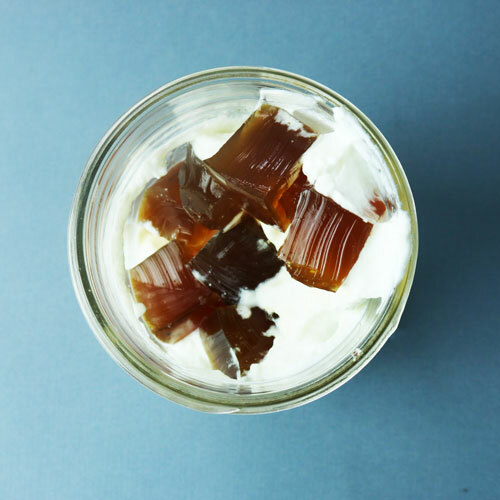 Coffee gelatin was popular during the early 1900s, especially in the New England region of the US. It went out of style after being recognized as a "poor person's dessert", but today has taken off in Japan - Atlas Obscura has a cool history on it for more info. We thought it'd be perfect with yogurt for breakfast, almond milk as a refreshing beverage or even by itself. Other recipes we saw added vodka or cream liqueur to make boozy jello shots. Maybe next time we'll try chocolate chip coffee jello? Mix in sweetener if needed.